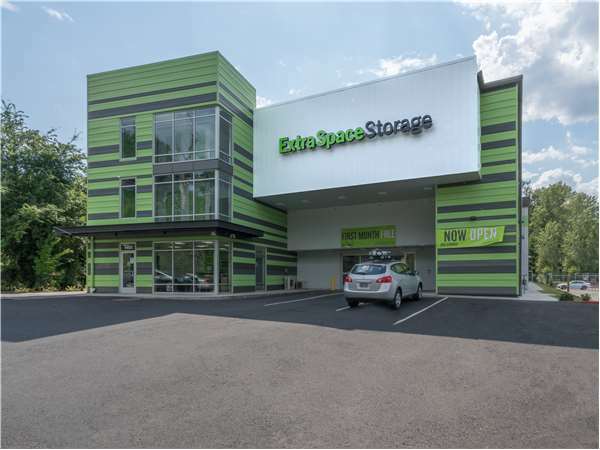 Located on SE Johnson Creek Blvd between SE 32nd Ave and SE 45th Ave, Extra Space Storage serves Milwaukie residents near Ardenwald, Lewelling, Darlington, Erroll Heights, and more. Locals will recognize our facility across from Johnson Creek Dental Care near Brookside Apartments. Looking for self storage close to campus? Extra Space Storage is about 2 miles from Reed University, making us a convenient option for college students in Portland who need summer storage or storage while studying abroad. Extra Space Storage on SE Johnson Creek Blvd offers a large selection of storage units, heated storage, and exceptional security. We're your go-to storage partner in Portland near Milwaukie! Some issues with add on costs but I'm a short timer. Customer service was great! Place is very clean and I have easy access and reasonable hours. I've researched other facilities, this one I believe was the best choice for me. The price was reasonable, climate controlled, close to where I live, easy access to the unit and another storage place was all rented out; so they referred me to Easy Access. One business refers to another, says a lot to me. Drive south on SE McLoughlin Blvd. Take the exit for SE Tacoma St. Merge onto SE Tacoma St. Continue onto SE 32nd Ave. Turn left onto SE Johnson Creek Blvd. Our facility will be on your left after SE Brookside Dr.
Drive north on SE McLoughlin Blvd. Take the exit for SE Tacoma St. Turn left onto SE Tacoma St. Continue onto SE 32nd Ave. Turn left onto SE Johnson Creek Blvd. Our facility will be on your left after SE Brookside Dr.
Drive west on SE Johnson Creek Blvd. Turn left at SE 45th Pl/SE Harney Dr to continue onto SE Johnson Creek Blvd. Our facility will be immediately on your right after the bridge. Drive east on SE Tacoma St. Continue onto SE 32nd Ave. Turn left onto SE Johnson Creek Blvd. Our facility will be on your left after SE Brookside Dr.